Why have Dance Heads at your Fair or Fes­ti­val? Dance Heads is an at­trac­tion that draws huge crowds, cre­ates ex­cite­ment including spon­ta­neous laugh­ter, and is a viral cor­po­rate brand­ing tool for spon­sors large and small. 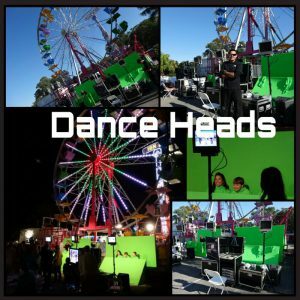 Dance Heads incorporates a sponsor’s logo on DVDs and as an added op­tion, can include the logo in the music video……NOW available with an EMAIL DELIVERY SYSTEM AS WELL. Statistically, each DVD is seen by ap­prox­i­mately 47 peo­ple in a 3-month pe­riod. 100% of the 90-sec­ond video is watched from be­gin­ning to end and at least 87% watch the videos 3 times or more in a sit­ting. The figures are also in on the NEW EMAIL DELIVERY SYSTEM and the exciting news is that participants receive the file immediately and share it instantly with their contacts and on social media collecting upwards of hundreds of views….and sometimes in the thousands…WOW! Sim­ply put, Dance Heads is a draw that will in­crease at­ten­dance at your Fair or Fes­ti­val through word of mouth, which ul­ti­mately adds to larger crowds, higher food sales and more entry fees. Many of our clients who put on fairs and festivals opt to bring in one or mul­ti­ple cor­po­rate spon­sors to un­der­write the daily at­trac­tion fee rather than pay­ing it through their en­ter­tain­ment bud­get.